Anyone who has studied Japanese martial arts—or who has at least watched any of the Karate Kid movies—is familiar with the black belt. Known in Japanese as a kuro obi (kuro=black, obi=belt); it is a sought after sign of proficiency in an art. Typically, it is given when a student attains a shodan, sometimes referred to as “first degree” black belt. What is obscure to some in the West is that dan actually means step or stage and that, rather than a sign of mastery, a newly award black belt means that the student has taken the first step in a 10 stage ranking system. But, why a belt? 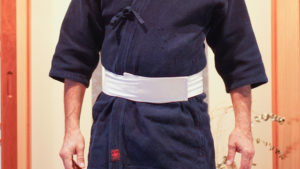 Why is this accessory so important in a martial arts uniform? Well, there is the obvious reason that it keeps the keeps the hara (top) tied together. 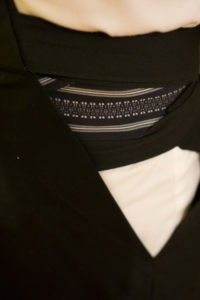 But, it certainly would have been possible to design an outfit with ties on the top, which would not require a belt. I am convinced that the belt, regardless of color, has another, ultimately more important function: it facilitates hara breathing. I remember feeling amazed when I put on my first wide obi. It gave me better awareness of the sensations in my lower abdomen. When tied properly, its snugness gave me a feeling that there was something to push against when I breathed. The tightness of the obi allowed also me to better relax my upper body as I expanded my lower abdomen. Further, the obi seemed to protect my lumbar spine in much the same way as a back brace does for someone with low back pain. When I later took the practice of kyudo (“Zen Archery”), I found that the obi allowed me to better use the power of my hara when lifting and drawing the bow. And, I soon found that I hated practicing without my obi; I simply could not engage my hara to the same degree without it. If I forgot or for some reason did not have my obi, I would not sit zazen nor practice martial arts. I discovered that there is an art to tying an obi. If I tied it too tightly, it constricted the expansion of my lower abdomen and stifled hara breathing. Tied too loosely, it did not give enough support or resistance in my lower abdomen; this also inhibited hara breathing. I found that there is a sweet spot between tying it too tightly and too loosely. With time, I could hit that spot without thinking. I was so impressed with the difference an obi made that I went on a quest, of sorts, to find the perfect one. At times, I felt like an obi savant. I tried a standard karate uniform belt. While it was better than nothing, it didn’t work as well as the wider one. I tried weight lifting belts. While they certainly support the lumbar spine, they cinch up too tightly. They made me appreciate the way traditional obis give and take slightly as I inhale and exhale. The weight lifting belt was simply too rigid, too static. The worst was a standard leather belt, the kind we usually use to keep our pants up. Not only are they narrow, like a karate gi belt, but they are also static, like the weight lifter’s belt. So I settled on the wide obi shown in photo. I tried different obis of different fabrics: cotton, wool and synthetic. I found that the natural ones work best. They are cooler in hot weather because they breathe and there is more the give and take than with the synthetic fabrics. 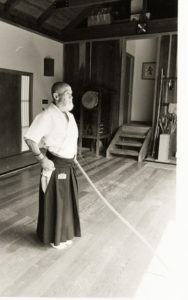 While I prefer the traditional wide obi for zazen, kyudo or and most hara development exercises, it has two limitations. First, because it ties in the back, it becomes uncomfortable when you lie on the floor on your back or when doing rolling activities, such as in aikido. The second limitation is that it is too bulky to wear under everyday clothing. Of course, it is possible to wear it over your clothing, but that is rather conspicuous and you might run the risk of looking eccentric. I have found that a good alternative to traditional obi is a thick one made of natural fabric that is secured with Velcro. The Velcro makes it easier to hit the sweet spot between too tight and too loose. Since it is made of natural fabric, it gives and takes with the breath. Because it does not tie, it is fine for floor and rolling exercises. Finally, you can wear it unobtrusively under everyday clothing; it can become your secret weapon at work or when you are doing intense, physical activity. This will allow you to better practice your hara breathing in everyday life. We now have Velcro obi available for sale. If you are interested, click here.